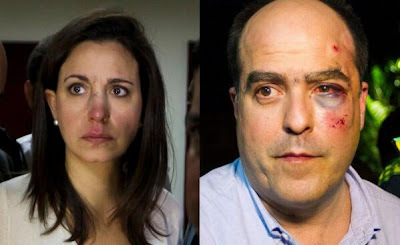 After Tuesday’s shameful assault at the National Assembly, people are trying to identify the man who punched Julio Borges. Nancy Asencio broke Maria Corina Machado’s nose in four places; that much is clear. Milán Reyes is the favored suspect on Twitter. Nicolás Maduro is president now thanks to the intervention and support of the Cuban Communist regime. His praetorian guard, so to speak, is Cuban. National Assembly president Diosdado Cabello, who according to the Venezuelan Constitution should have been interim president, has plans. He won’t be content with the status quo forever. Most observers predict that Maduro’s regime will not last long. So here’s the question: Who will succeed him, Capriles . . . or Cabello? Linked by Babalu. Thank you! The purge is going on, indeed!